good post OP, thanks!! I love it!! Not sure why this is cold, lowest price for what looks a much better title than Ashes. Free tickets to the spec savers county cricket through sky V.I.P. 2 per account. Booking through my sky app. I got 2 yesterday for Day 1. But it doesn't allow you to go for anymore on another day unfortunately. Mind you, it's gonna be FREEZING! second that totally. Test cricket is a long slow burn, and you have to have patience to appreciate what youre watching. Just watch the tension between the players and captains as they think out their strategy. Which I dont mind IPL, its just try and hit every ball for six. Bowling skills have been totally demeaned in IPL / T20. Are you sure about that? Imagine the inception! Hey, I have an idea. I throw a ball at some sticks, you try and hit it with a big stick, then run back and forth between a set of sticks! WHOOOOOOO! AWESOME! so during the cricket matches the channel will become unencrypted and available for free without a subscription????? Is it HD the channel and free? The only downside with this channel is they don’t show highlights.either watch the full match which most people don’t have time for or it’s nothing.as with sky sports they put 1 hour highlights throughout the next couple days. Has everyone seen tHe IPL is on freesky? Well done Quetta Gladiators. Thank you Hum Masala. Hope you all enjoyed it. Final has started. Live on Hum Masala (Sky Channel 720. Empty stadiums. Now that the PSL is taking place in Pakistan, what do you say? Full house in every match and guess what no match fixing, unlike IPL. The only reason why you have more fan following is because of the huge population India has. Otherwise IPL cricket is not competitive as it is haven for batsmen and flat track bullies (FTBs). Look at the local talent in PSL and compare that to the some of the most expensive local buys in IPL (Dinesh Kartik, Ravendera Jedeja, Udakat etc). Look at their domestic T20 records, they are not worthy of 100k but were bought for millions USD. The national stadium is buzzing with tremendous atmosphere today and level of cricket is brilliant. I am a big fan of some of the Indian cricketers and I am not against Indian cricket and to put things in perspective and as once said by the great Imran (Khan) the best team he came across is the 1983 Indian world cup cricket team when they beat the mighty West Indies to win the world cup. Just watch and enjoy. 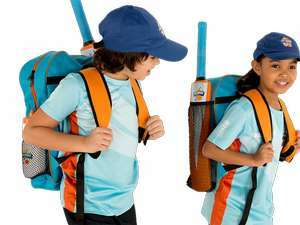 Never miss a 'Cricket' deal again! I've heard that leek and daffodil soup is good for insomnia. Great find, thousands of Yorkies will probably be there, they are known to be wise with their money! How do you access this channel? Is it on Freeview? Almost impossible to watch any sport on that channel. Horrific picture quality. But it's free, so heat from me! 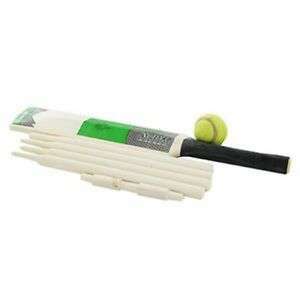 All surface cricket set for kids age 3+ @ Chapel Allerton for £2.99 Nice set to keep kids busy inside and outside. Back in stock and another price drop for this! mine arrived yesterday and im not sure why but I was surprised it was brand new - for some reason I thought these would be pre-owned at that price. Bowling is incredibly difficult but quite enjoyable! Damn it, I spent 7.95 on this a few months ago (lol) Well worth it, good deal! For £5.95 I can get over quite a lot. 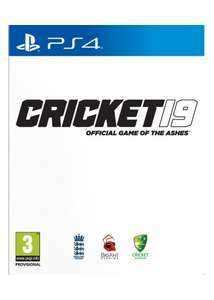 Will they patch this game soon to update the fact that Warner, Smith and Bancroft are banned for being cheats!? Member since 2010? 1 deal and 42 comment in total? Speaks volume about your contribution to this site.... not to mention your insightful comment on afghan people.......next time you think of commenting make sure you read HUKD code of conduct. I had tickets booked and got a refund which, technically, they didn't have to do so fair play England. True enough that the match didn't last long but it was a good day out with a nice atmosphere. I went round to the back of the pavilion at the end of the match and all the England cricketers signed autographs and posed for photographs from any fan who asked. They were really good sports. I love this game. Er, well even if that’s true, England aren’t touted as the World’s no. 1 Test team. Isn't that more than England can muster? Cold as it does not allow to order error come.up "An error occured in the application. Please use the search below to assist you in finding what you are looking for." Thanks for the most random post today OP, will be great for sports fans. Apart from the musk flavour, all of them smell like soap. Cold for tge aftershave. Hot for ball. Purchased 2 of the tuners this week and set them up on an AMLogic S912 box and a Cherry Trail mini PC. Works flawlessly and have 2 separate muxes, so can watch one channel whilst recording another, all for less than a tenner. Generic instructions here for anybody that wants to go down the same route. Don't think so. Needs a proper antenna, a dish is for catching satellite signals.